SimpliVity and Nutanix hyper-converged infrastructure offerings remained neck-and-neck among Modern Infrastructure Impact Award voters. SimpliVity OmniCube won the converged and hyper-converged platform category in 2013, and SimpliVity OmniStack came a close second to Nutanix for this year’s Impact Awards. 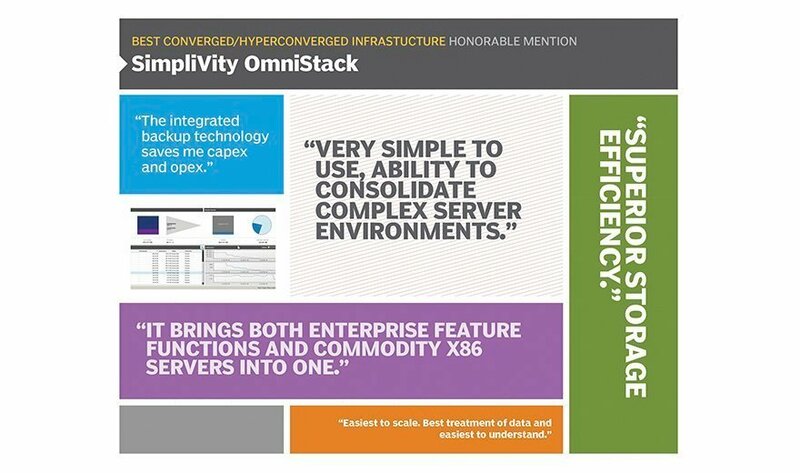 SimpliVity OmniStack is a hyper-converged infrastructure platform on Cisco UCS x86 servers. The compute and storage hardware support hypervisor-based virtualization, backup and replication with real-time depublication, cloud connections, WAN optimization and other modern IT requirements. Voters like the commodity x86 servers underlying the converged management and operations, and one IT pro said the OmniStack takes data virtualization "that much further." One SimpliVity user affirms that hyper-converged was the right replacement for traditional servers and storage. Tanner LLC, an accounting firm in Salt Lake City, Utah switched from HP to SimpliVity OmniCubes on Dell hardware about a year ago. "I sleep a lot better at night knowing full copies of my servers back up offsite multiple times a day on hardware that we own," said Matt Huff, IT director at Tanner. He voted for the SimpliVity OmniStack because SimpliVity makes storage resource provisioning easier, and management all takes place in VMware vCenter. Storage utilization is growing slowly, with deduplication and compression features, he added. What features do you want in a hyper-converged infrastructure platform?